These antibodies inhibit the binding of the drug denosumab to its target, RANKL (receptor activator of nuclear factor kappa-B ligand), and therefore detect free drug. A pair of these antibodies is ideal for development of a pharmacokinetic (PK) bridging ELISA. 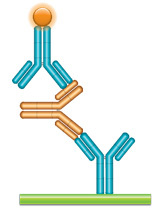 Three antibodies of high, medium or low affinity are suitable as a reference standard for an anti-drug antibody (ADA) assay. This non-inhibitory antibody does not inhibit the binding of denosumab to RANKL and can therefore detect total drug – free, partially bound and fully bound. This antibody can be used in conjunction with an inhibitory antibody in a PK bridging ELISA to measure free drug. 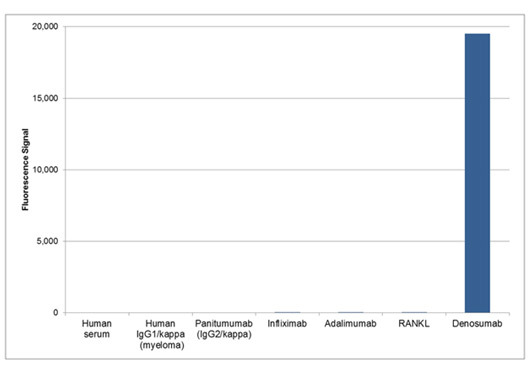 Table 1: Antibodies Specific to Denosumab. Schematic image of PK bridging ELISA. 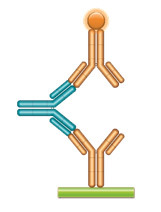 Anti-idiotypic capture antibody, Ig format (blue), monoclonal antibody drug (gold), anti-idiotypic detection antibody, Ig format, labeled with HRP. Fig. 1. 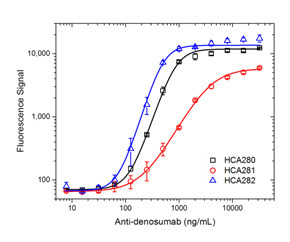 Denosumab PK ELISA bridging format using antibodies HCA280 or HCA282 and HCA283P. In Figure 1, Human Anti-Denosumab Antibody, clone AbD26295_hIgG1 (HCA280) or clone AbD26862_hIgG1 (HCA282) was coated on a microtiter plate at 1 µg/ml and left overnight. Washing and blocking was performed with PBST + 5% BSA. PBST with 10% human serum was added, spiked with increasing concentrations of denosumab. Detection was performed using HRP conjugated Human Anti-Denosumab Antibody, clone AbD26781_hIgG1 (HCA283P) diluted to 2 µg/ml in HISPEC Assay Diluent (BUF049A), plus QuantaBlu Fluorogenic Peroxidase Substrate. Data are shown as the mean of four measurements. Fig. 2. ADA bridging ELISA using antibodies HCA280, HCA281 and HCA282. In Figure 2, denosumab was coated at 1 µg/ml on a microtiter plate overnight. After washing and blocking with PBST + 5% BSA, PBST with 10% human serum was added, spiked with increasing concentrations of Human Anti-Denosumab Antibody, clones AbD26295_hIgG1 (HCA280), AbD26296_hIgG1 (HCA281) or AbD26862_hIgG1 (HCA282). Detection was performed using HRP conjugated denosumab at 2 µg/ml in HISPEC Assay Diluent, and QuantaBlu Fluorogenic Peroxidase Substrate. Data are shown as the mean of three measurements. 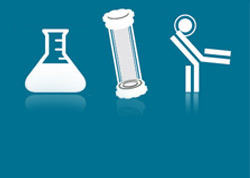 HRP conjugation of denosumab was performed using a LYNX Rapid HRP Antibody Conjugation Kit®. Fig. 3. Demonstration of inhibitory properties of antibodies HCA280, HCA282, HCA283 and HCA288. In Figure 3, Human RANKL was coated on a microtiter plate at 1 µg/ml overnight. 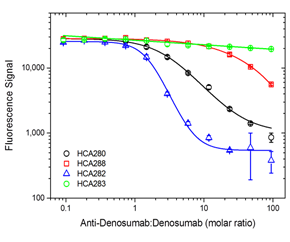 After washing and blocking with PBST + 5% BSA, denosumab was added (0.3 µg/ml), spiked with increasing concentrations of antibodies HCA280, HCA282 and HCA283 (all in monovalent Fab format), and HCA288. Free denosumab, still capable of binding to the RANKL coated plate, was detected using Mouse Anti-Human IgG (Fc) CH2 Domain:HRP Antibody (MCA647P) followed by QuantaBlu Fluorogenic Peroxidase Substrate. Data are shown as the mean of three measurements. It should be noted that in this assay set-up, the non-inhibitory antibody HCA283 shows a slight decrease in signal. This is most likely due to different binding modes of the denosumab-RANKL complex at higher denosumab concentrations (Arthur et al. 2012). Fig. 4. 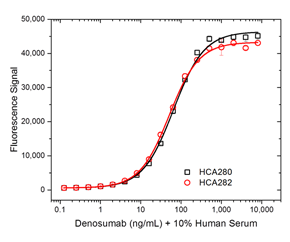 Demonstration of the specificity of antibody HCA288 to denosumab. In Figure 4, a microtiter plate was coated overnight with various antigens at a concentration of 5 µg/ml. After washing and blocking with PBST + 5% BSA, detection was performed using HRP conjugated Human Anti-Denosumab Antibody, clone AbD26296 (HCA288) at a concentration of 2 μg/ml and an HRP conjugated anti-DYKDDDDK tag antibody in HISPEC Assay Diluent (BUF049A) and QuantaBlu Fluorogenic Peroxidase Substrate. Fig. 5. 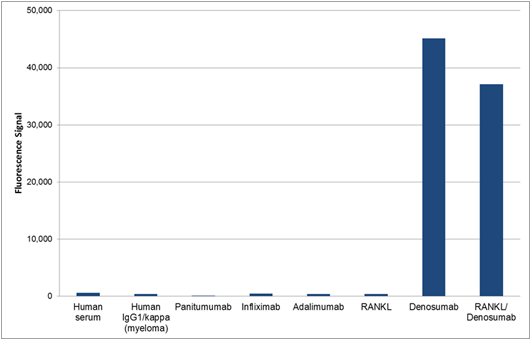 Demonstration of the specificity of antibody HCA283 to denosumab and RANKL/denosumab complex. A microtiter plate was coated overnight with various antigens at a concentration of 5 μg/ml. After washing and blocking with PBST + 5% BSA, detection was performed using HRP conjugated Human Anti-Denosumab Antibody clone AbD26781_hIgG1 (HCA283P) at a concentration of 2 μg/ml in HISPEC Assay Diluent (BUF049A) and QuantaBlu Fluorogenic Peroxidase Substrate.